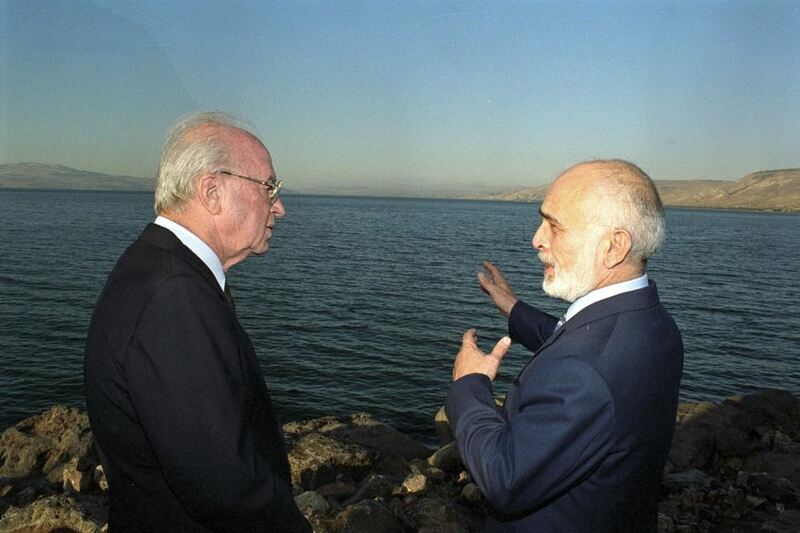 Israeli Prime Minister Yitzhak Rabin and King Hussein of Jordan confer at Lake Tiberias after signing the Israel-Jordan peace treaty in 1994. Photo: Saar Yaacov. As outlined in ‘Water Resources’, most of Jordan’s water resources (surface and groundwater) are shared with neighbouring countries and the majority of these shared resources originate outside the country. Shifting regional relationships have affected Jordan’s access to these shared resources throughout the country’s history. In several cases, Jordan has received less than its equitable share of the resource, as upstream neighbours overexploit rivers and groundwater sources through damming, diversions and pumping. Thus, Jordan’s access to water from the Jordan and Yarmouk Rivers is affected by the fact that Israel and Syria extract large quantities of water upstream. Groundwater resources are similarly contested as a large portion of Jordan’s groundwater originates from aquifers that are shared with Syria and Saudi Arabia. The Johnston Plan of 1955 was the first attempt at addressing shared water resources after the United Nations’ political partition of the area in 1947. The plan outlined an allocation agreement for the Jordan River Basin among the countries that share the resource. According to the Johnston Plan, 55% of the available water in the basin would go to Jordan, 26% to Israel and 9% each to Lebanon and Syria. The process was mediated by the UN and the committees representing each country agreed to the plan. However, the plan was never ratified and instead each riparian state with access to the Jordan River has implemented unilateral projects, disregarding the outlined allocations. As Jordan is a downstream state in the Jordan River Basin and Israel and Syria extract considerable amounts of water upstream, Jordan no longer has access to its equitable portion of the Jordan River. Moreover, the Lower Jordan River is now severely degraded, as previously discussed in ‘Water Resources’. 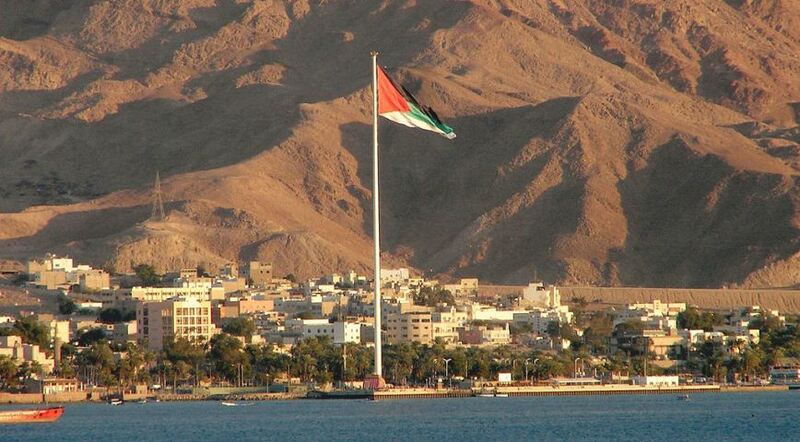 As a part of the 1994 peace treaty, Jordan and Israel reached an agreement on the distribution of Jordan River water. Although the Johnston Plan allocated the largest share of the river to Jordan, under the peace treaty Israel agreed to transfer only 50 MCM/yr of water from Lake Tiberias. Additionally, there is agreement that the two countries will work together to address the ongoing water shortage in the Jordan River Basin by minimizing wastage, preventing contamination and developing further water resources. There are no formal water-sharing agreements with Saudi Arabia. While Jordan recently completed a large pipeline to transfer groundwater from the Disi Aquifer to the north of the country, there is no clear agreement with Saudi Arabia on the joint management or protection of this water resource. Jordan and Syria signed the first bilateral agreement regarding the Yarmouk River in 1953. While the agreement did not specify allocation of water resources, it did address irrigation and power generation through the construction of various dams on the river. The agreement also resulted in creating a bilateral commission, responsible for monitoring and resolving, via arbitration, any disputes or other issues between the two countries over the Yarmouk River. A 1987 treaty modified the 1953 agreement between the two countries. Jordan was committed to covering all the costs (from planning to ongoing maintenance) of the main irrigation dam to be built on the Yarmouk River on the Jordanian-Syrian border. This dam is known variously as the Maqarin, Unity, Wahdah and Wihdeh Dam. The treaty also stated that Syria was allowed to build up to 25 additional dams on the river system, while it committed to providing Jordan with 208 MCM/yr of water from the river. A new commission was established with fewer oversight powers and no arbitration abilities. An additional agreement was reached in 2001, reducing the size and capacity of the main dam. Final agreement on the dam construction project was not reached until 2003; construction finally began in 2004, and the dam was completed in 2005. However, Syria’s significantly stronger power base (including its upstream location on the river) has resulted in Jordan rarely receiving the full benefits of either the 1953 or the 1987 agreement. Under the 1987 agreement, Syria has the right to use 6 MCM/yr downstream of the Unity Dam to irrigate land along the riverbank. However, since the agreement was signed, Syria has increased the number of dams constructed along the course of the river and its tributaries from 26 to 48. It has also built about 3,500 wells to pump water to irrigate farms outside of the river basin. Syria has consistently failed to provide Jordan with the agreed volume of water, despite Jordan’s regular official diplomatic calls for Syria to meet its treaty obligations. In 2013, it was reported that the annual amount of water actually released annually to Jordan from Syria was in the order of 50 to 100 MCM, far short of the 208 MCM agreed in the treaty. While Jordan still wants to find a political solution, rather than dispute this more vigorously with its more powerful neighbour, it has turned to internal strategies to manage its water resource needs (see ‘Reducing Water Use’). Manna, M., 2006. ‘Water and the Treaty of Peace between Israel and Jordan’, Macro Center Working Papers (33). Jordan Times, 2015. ‘Jordan, Saudi Arabia sign deal to protect shared aquifer’. 2 May 2015. ECC Platform, 2015. Yarmouk River: Tensions and cooperation between Syria and Jordan. Jordan Times, 2012. ‘Yarmouk water sharing violations require political solution’, 28 April 2012.